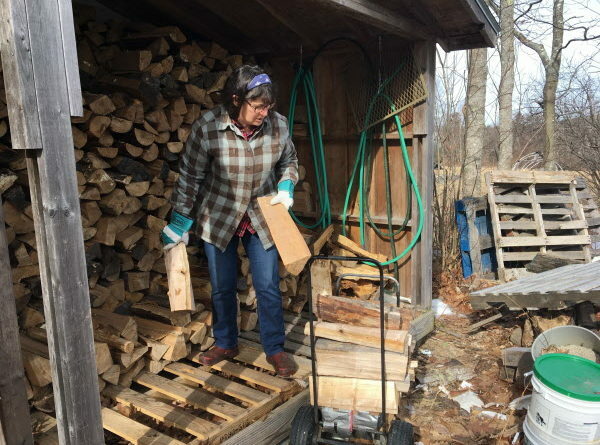 Jo Barrett grabs a load of firewood for her wood furnace. Purchasing cut, split wood is a luxury she now allow herself following the death of her husband. When Susan Hunter and her husband Alan started their Unity dairy farm in 2008, it was with an eye toward a shared future of raising animals and living a life close to the land. 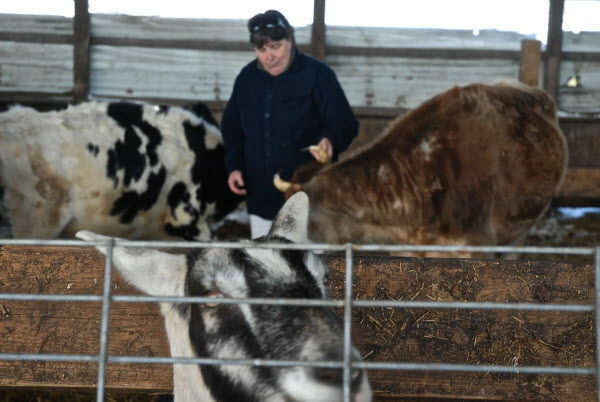 An hour and a half away in Penobscot, Jo Barrett and her husband Dennis King were living a similar dream on their diversified farm and making plans to turn it over to a younger couple and retire. What neither couple had planned were how illness and death would leave the two widows left to figure out what was next for their respective farms. Susan Hunter, now 62, first met lifelong dairy farmer Alan Hunter when she was 17 years old. In addition to working on his family dairy farm, Alan Hunter spent years working with the United States Department of Agriculture and later the Maine Department of Agriculture, Conservation and Forestry. The couple purchased the land in 2008 and a year later they added the 64 cows that became Suzie Q Dairy. In the fall of 2010, he was diagnosed with multiple myeloma, a cancer that attacks the white blood cells. For the next six years, Susan Hunter found herself balancing managing a working dairy that at times numbered 120 cows, with getting her husband to and from treatments at cancer facilities in Boston and Augusta. Luckily, she had help from family and friends who were always ready to lend a hand with farm chores or keeping her husband company while she worked the farm. The cancer eventually became too much for the treatment. In early December 2015, Alan Hunter entered Hospice care on the farm, passing away at home on Dec. 11. Jo Barrett was a 36-year-old homesteader with a love of wild edibles and a teacher when she met Dennis King in 1991. Together, the couple worked to raise vegetables and animals on King Hill Farm while Barrett continued to teach part time to provide a steady income to supplement what they made from farming. In 2007, the couple looked around and decided the time was right for Barrett to leave teaching and join her husband on the farm full time. But leap they did, developing King Hill into a successful organic vegetable and livestock operation and working side by side until King, then 67, suffered a stroke following hip surgery in 2009. King spent three months in a Bangor hospital followed by three more months at a rehabilitation facility in Augusta. Among the faces on Susan Hunter's farm is Caddy the goat who is a constant companion during barn chores. Prior to the stroke, King and Barrett had identified and been working with a young couple who had committed to taking over the farm upon their deaths. King’s stroke put everything on a fast track that eventually led to the couple taking over the farm while Barrett and King moved to a home that could better accommodate her husband’s condition. By August she had found and closed on a house with a view of a nearby mountain, a five-minute drive to town, a garden spot and proper orientation for solar panels. But over time, she said, he became less and less interested in life outside the house and eventually passed away in 2017. That first year following Alan Hunter’s death, all Susan Hunter wanted to do was keep things going as they had been on the farm. Hunter said she kept at that pace in part to keep things as her husband had them and in part because it kept her close to the land he loved so much. Grieving the loss of a spouse, according to Kate Roberge, licensed social worker and grief counselor in Falmouth, is a journey and a big part of that journey is defining a new normal. That drive to keep things the same as they were when the loved one was alive — like Hunter milking the cows and baling hay — is a universal response to grief, Roberge said. For Hunter, that meant selling off all the dairy cows this past year while keeping seven head of beef cattle she hopes to one day turn into a meat-producing herd. That, she said, has left her facing a different life on the farm than she had envisioned. For Barrett, that process began before the death of her husband. That spring morning in 2010 when she woke up with the knowledge she could, in fact, leave the farm was a major turning point. Susan Hunter and two of her barn cats head toward the barn on a chilly winter morning to check on the remaining seven cows on her farm. After the death of her husband in 2015, Hunter sold off most of the couple's dairy herd. Every change on the farm or in her personal life since the death of Alan Hunter has left Susan Hunter re-defining her normal. Part of that has meant going back to work on a part-time basis in-home health care off the farm to make up for the loss of her husband’s income. Hunter is also working with a young couple interested in leasing land on the farm while helping her establish a beef market and raise vegetables for sale. For Barrett, that new normal has meant allowing herself certain “luxuries” as a widow. Nothing about that is easy, Roberge said, and grieving spouses need to give themselves plenty of breaks. Hunter said she still has a lot to figure out in her role as a farmer and as a widow. Barrett is open to whatever the future brings. A list of grief support resources in Maine can be found at www.psychologytoday.com. Correction: A previous version of this story misspelled King Hill Farm.